If you are a church or community leader you are warmly invited to join us at The Mission Practice on Thursday 20 March from 8:30am – 9:30am for a networking breakfast, with a focus on sharing the progress of a whole person care project currently being piloted in Bethnal Green. In this Blog, our Development Director Tim Thorlby delves into the Census to explore some of the evidence about one of East London’s fastest growing religious groups – the one without any religion at all…. Recently, the Anglican Bishop of Stepney circulated a weighty tome of data about his area in east London – the Stepney Contextual Survey 2013. His researcher has pulled together lots of about the Stepney Area – Islington, Hackney and Tower Hamlets – and painted a statistical picture of this deprived and diverse area and how it is changing. It is certainly not light bedtime reading, but it contains some fascinating observations. Hackney Foodbank N16 from Kristian Buus on Vimeo. In this post Helen Moules from the Shoreditch Group recounts the highs and lows of the last year as the Hackney Foodbank has dealt with well over 1,000 clients. See above for a video telling the story of the foodbank. Local churches were galvanised by the desire to address food poverty in Hackney, based on the clear needs being witnessed by churches throughout the borough. The Indices of Multiple Deprivation, which draws together a range of deprivation indicators, ranks Hackney as the second most deprived Local Authority in the country. According to the Campaign to End Child Poverty, 44% of children in Hackney live in poverty. This is the third highest level of child poverty in England. With the profile and need for foodbanks gathering pace across the country, It was more a question of when rather than if a foodbank would open in Hackney. Hackney Foodbank: the story so far. Nationally, 1 in 5 people live in poverty. As many families hit crisis and cannot afford food, people are going hungry in their own homes. Rising food and fuel prices, static incomes, high unemployment and changes to benefits are causing many families to struggle to put food on the table. This month saw the official launch of the Hackney Foodbank – a much needed service for people across the borough, which has been set up by the Shoreditch Group. The Shoreditch Group is a relational network of local church leaders who seek to collaborate, sharing our capacity and resources in order to meet need and bring hope and good news in our community. Conversations began in 2011 between local churches in the network who were galvanised by the desire to address food poverty in Hackney. According to the Campaign to End Child Poverty, 44% of children in Hackney live in poverty. This is the third highest level of child poverty in England. Save The Children research documents that 22% of children in Hackney live in severe poverty – where a household has an income below 50% of the median (after housing costs), and where both adults and children lack at least one basic necessity. Hackney has the sixth highest rate of primary school pupils (36%) and fourth highest rate of secondary school pupils (38%) eligible for free school meals in London. According to the last comprehensive statistics, 15% (13,806) of households in Hackney were living in fuel poverty, the fourth highest rate in London – that is where the amount of energy needed to heat a home to a comfortable standard costs more than 10% of the household’s income. These stark facts prompted action from a cluster of churches in the south of Hackney, mainly around Hoxton. They were beginning to explore setting up a local foodbank. We contacted The Trussell Trust, a Christian charity whose community projects tackle exclusion and poverty in the UK and Bulgaria. 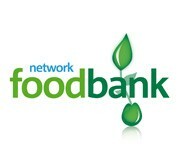 The Trussell Trust’s UK foodbank network partners with communities nationwide to launch foodbanks that provide three days of emergency food to men, women and children in crisis. The economic downturn has seen the need for foodbanks soar right across the UK. New foodbanks are opening at the rate of three a week and the number of people fed by foodbanks has doubled to almost 130,000 in the last year alone. 1. Schools, churches, businesses and individuals donate non-perishable, in-date food to the Hackney foodbank. All food given out by the foodbank is donated by local people and collected by volunteers at supermarkets, and is also given regularly and at special times of year – including Harvest and Christmas – by churches, schools, businesses and community organisations. 2. A team of volunteers manage a warehouse operation on a weekly basis, weighing and sorting new donations, managing the rotation of stock and ensuring local distribution centres are kept replenished. 3. The foodbank builds relationships with a wide of local front-line care professionals such as the local Citizens Advice, children’s services, housing, probation, health and other welfare services, as well as Job Centre Plus, who can identify individuals or families in crisis. The foodbank registers these agencies and allocates vouchers which allow them to refer clients directly to the foodbank distribution centres. 4. Foodbank clients bring their voucher to a foodbank centre where it can be redeemed for three days of nutritionally balanced food. Foodbanks are an emergency food service: to prevent dependency on foodbanks, clients are entitled to up to three consecutive foodbank vouchers. To help clients break out of poverty, we signpost clients to organisations able to resolve the underlying problem. Over the last several months, Hackney Foodbank has established itself as a registered charity and has now been supporting local people for 14 weeks. It is operating two weekly distribution centres – in Hoxton and in Stoke Newington. Since opening on September 3 we have fed 283 people, referred to us by many of the 48 front line agencies that are already registered as foodbank voucher holders in Hackney. Of the more than 6 tons of food donated so far, we have already distributed over 1.5 tons. 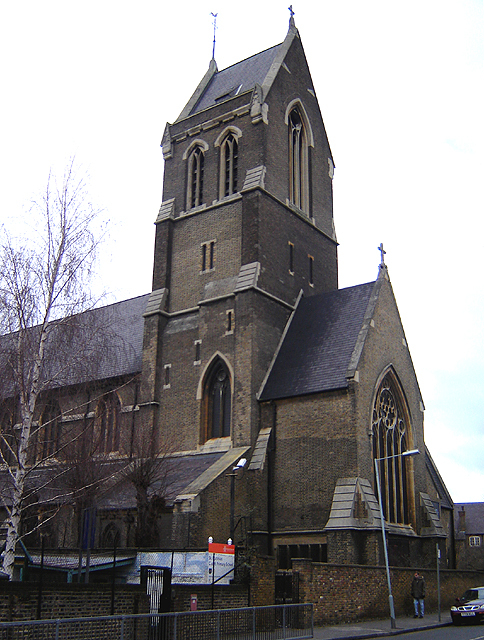 St Matthias, Stoke Newington, where the launch of Hackney Foodbank took place. 31 Churches, 15 Schools and children’s’ centres, 15 business and community organisations, and over 60 individual volunteers drawn from local churches and the community have come together over the last year to enable this service to be provided. The Shoreditch Trust, a charitable regeneration agency, and St Matthias Church are each providing venues at no cost which host Hackney Foodbank’s weekly distribution centres. Sainsbury’s, Morrisons and Tesco – who have a presence in the borough have put in place a rolling programme of annual collections. Our Lady and St Joseph Primary School in Dalston collected a third of a ton of food alone. Many other schools and churches have donated their harvest produce, often in excess of 100kg. Woodberry Down Children’s Centre organised a collection on behalf of the Foodbank in celebration of Eid. Safestore in Stoke Newington have provided us with a 150 sq ft unit to store our food and their staff are able to receive donations of food on our behalf from people coming in off the street. St Joseph’s Hospice, a registered foodbank voucher holder, has provided staff expertise to train our volunteers in understanding the welfare benefit issues our clients face. In addition, the hospice has set up its own weekly collection point for staff, patients and visitors to donate weekly to the foodbank. Committed compassionate volunteers with daytime availability, including many drawn from the churches that are supporting us, are the key to ensuring that the food we have been fortunate to amass can be made available to those in crisis. We are grateful for those individuals who have been getting alongside those we are serving. What is the long term vision for Hackney Foodbank? In due course, as resources and volunteer capacity grow, Hackney Foodbank will seek to expand the number of local distribution centres in Hackney in order that a greater number of clients in need can more easily access a foodbank in their neighbourhood. All of us are aware of the pending impact of changes to the Social Fund and the welfare benefit cap and in anticipation of increased demand that we expect to see on our service we are already planning for that growth in Spring 2013. We know this is only the beginning of the journey but we look forward to continuing to involve our local community. Maps are great when you want to get from point A to point B. I have spent the last three months finding out how this is true in an entirely unexpected way. Whilst interning at St Peter’s Church, Bethnal Green I have discovered an entirely different way of using maps as a guide; not to get from a geographical point A to a geographical point B but as a means to help get from a general problem towards specific, achievable change. At the beginning of October I was tasked a mapping project to help better understand the needs within the parishs. To do this I needed to use a very modern type of map known as a Geographical Information System (GIS). If you are unfamiliar with a GIS, imagine an interactive version of Google maps – upon which you can add layers of important information. What this gives you is an interactive data store tied to specific locations – in other words, a very effective means by which to tailor a church’s ministries and social projects to areas of greatest need. If you are still unsure, let me give you an example. Recurring themes of our listening within the parish are the impact of unemployment and poverty. From research we have undertaken I was able to find a huge swathe of demographics at multiple levels within our parish; at the borough, ward and estate level. We now have data on unemployment, age, ethnicity and even tenant satisfaction – just to name a few. So what to do with all this data? We can now use this data to find the estates with (for example) the largest levels of unemployment, or the highest rents and target ministry to these most needy areas. We can now act with precision as opposed to vague gut instinct; we can make a deeper impact for God’s kingdom in Bethnal Green. GIS is also helping the work we are doing to build a safer neigbourhood. We have been able to plot on the map the location of our 30 ‘CitySafe Havens’ – shops and businesses which are now working with St Peter’s and Shoreditch Citizens to provide safe havens to people in danger of gang violence. We’ve also come across this website on London Street Gangs, and are checking and mapping the information. Modern technology is opening up remarkable ways for us to work for God’s Kingdom – and GIS mapping is one very exciting example. I’m sure Charles Booth would have jumped at the chance to use this when he mapped poverty in London back in 1898! The square mile around Shoreditch High Street at the Hackney Road interchange is a curious mixture of trend-setting creativity and (often hidden) deprivation – with 75% child poverty and 40% unemployment in this area). The Shoreditch Group is a network of local Christian leaders committed to social transformation. Under the patronage of Lord (Nat) Wei, it is overseen CTC’s Senior Tutor, the Revd Adam Atkinson. Helen Moules (the Project Co-ordinator, based at St Peter’s Bethnal Green) will be blogging on some of the exciting ways this vision is taking flesh. It’s a great example of the Contextual Theology Centre’s mission in action: equipping churches to engage with their communities.